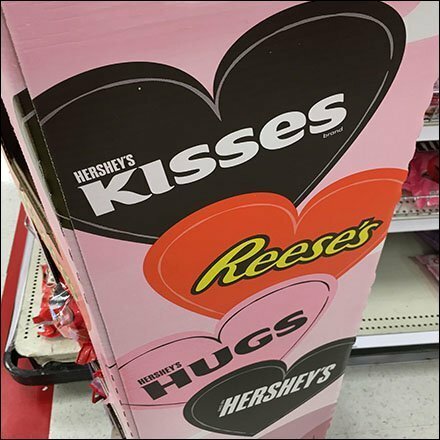 This Hershey’s Hearts Corrugated Tower Merchandising appropriates Holiday Hearts for all popular lines including Hershey’s Kisses, Reeses Peanut Butter Cups, Hershey’s Hugs, and plain old mainline Hershey’s chocolate. Seems like Hershey’s is preempting Valentine’s Day for its own nefarious reasons. This Hershey’s Hearts Corrugated Tower Merchandising seen at Target.